I haven’t done a Bookshed Review for ages – mostly owing to the fact that when I’m reading and writing for school, I don’t have room for much else. 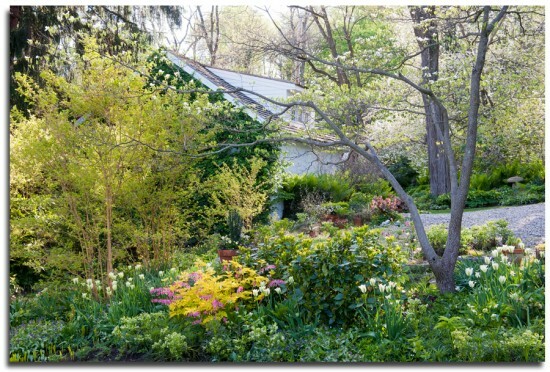 But since its term paper time, and I’m procrastinating – not to mention dreaming that spring will one day come again – it feels like a good day to talk about The Layered Garden: Design Lessons for Year-Round Beauty from Brandywine Cottage by David L. Culp (published by Timber Press, September 2012). Normally I don’t go for coffee-table-esque garden books (I tend towards practical guides) – but Culp manages to pull off something quite special with this charming ramble in which he combines the stunning photography of Rob Cardillo with personal narrative and useful garden advice. Specifically, his photos and text focus on the creation of gardens that retain beauty and “peak moments” throughout the year. Using his Brandywine Cottage as an example, Culp walks the reader through the various aspects of the 2.5 acre garden he has co-created with his partner Michael Alderfer. Starting off with a chapter on the concept of the layered garden – the combinations of plantings that allow for a garden that always has something to offer – he moves onto a chapter that focuses on specific features of his own creation, and then follows that with a section that explores what each group of plantings do in each season. Each part is rich with photographic examples, tips, anecdotes and how-to information as Culp imparts his years of gardening wisdom in an read that maintains a straightforward and yet intimate approach throughout. (Here I should mention that garden-writer Adam Levine supported Culp’s writing process – and I hazard to guess, that it is his polish that helps the prose along). The “Jewel Box” at Brandywine Cottage in spring. Having lived in the Urban Crow Bungalow for just over three years now, I have finally begun to shift my focus away from the backyard, which serves the purpose of being a spring and summer garden (food producing, flowers, fruit trees, aesthetic hanging out space) – to the front yard, which I would like to have year-round appeal. When moving into a new place, as Culp mentions, it takes time to determine what each garden space should be and how it will work with the desired aesthetic of the home. While we only have a small city lot to work with – there are still several mini-gardens at play – and I have not (by a long shot) got the details down on each of them yet! Using some of Culp’s plant advice, I have already begun to think more about the winter aspects of our garden, and currently have a focus on evergreens and late-blooming shrubs that I would like to build on as I fill in the “missing” pieces year-by-year. In particular, I appreciate his approach to each area by theme such as the ruin garden, or the “jewel box” which allows the focus on a specific aesthetic in each group of plantings. If you are thinking about a holiday gift for the gardener in your life, this is certainly a worthwhile book for the gardenshed. A book to dream away the winter with, while waiting for the onset of a new spring of planting. Looks like a lovely book. I wish I had that kind of space to work with but my intimate small garden forces me to choose only the things i really love and that’s nice too. Thanks for liking my posts.